Season’s Greetings, Many Happy Returns? In 1960 Ame rica held 16.9 percent of the world’s tonnage with 2,926 cargo vessels and tankers, against a total capacity of 17,317 vessels worldwide. At the turn of the century that number had dropped to 282 vessels registered under the U.S. Flag. It represented only 1.0 percent of the world fleet. By 2016 according to the D.O.T. that number had dropped again to 169 ships representing only 0.4 percent of world tonnage. Container carriers and general cargo vessels were down to a total of 108 bottoms and the roll on roll off sector was down to 28 ships. Under current conditions America’s merchant marine capability would be sorely tested in times of need. Fortunately, many U.S. companies are stepping up to the plate to build or re-flag ships under the Stars and Stripes. On the evening of April 14th, 1912, the HMS Titanic was making her way from Southampton to New York. Steaming off the coast of Nova Scotia she collided with an Iceberg at 11:40 pm. By 2:20 am after taking on water along her starboard side, the “unsinkable” vessel foundered, broke apart, and sank with over a thousand souls on board. In response to this tragedy, the International Ice Patrol (IIP) was set up to monitor the flow of icebergs within shipping lanes between Europe, Canada, and the United States. How will ocean-borne commerce be affected? I think you will find this article interesting. Launched in 1851 the “Flying Cloud” was the fastest clipper ship under sail. Making the run from New York to San Francisco in 89 days 8 hours, she set the record as the fastest Packet ship afloat, a record which would stand for 100 years. 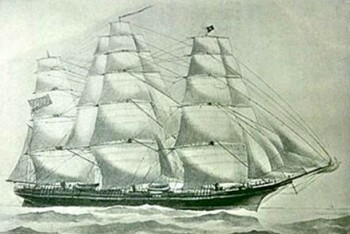 In 1838 the SS Great Western became the first trans-Atlantic passenger liner to integrate steam with sail. By the mid-1800s, the Peninsular and Oriental Steam Navigation Company (P&O) was challenging the idea of long distance sailing routes with service to and from the Far East. The age of the commercial steamship was born. Marine architects, however, remained fascinated with commercial wind propulsion through the early 20thcentury. In 1924 German engineer Anton Flettner combined cylindrical “sails” with a rotary turbine which not only produces power to the generators but also forward drive. The rotation of the cylinder creates a force known as the Magnus effect which is similar to the spin on a baseball. The resulting force pulls the ship ahead adding speed and motion. Recently this technology has been refined and incorporated into a modern design from Norsepower Corporation of Finland. Under favorable conditions the sail allows the vessel to maintain speed while reducing power to her main engines. The net effect is both a savings in fuel and a reduction of carbon emissions. Norsepower Rotor Sails incorporate computer sensors which continually monitor wind across the sail, adjusting them as needed. They can be installed on new builds or retrofitted to existing vessels. Offering a total solution to auxiliary propulsion, Norsepower provides delivery, installation, and maintenance of their rotors. I think you’ll find it interesting! As we usher in a new administration, there is much speculation about the direction our trade policies will take. Campaign rhetoric leaned heavily toward abrupt change in dealing with our trading partners and talk of high import tariffs to protect American workers had been bandied about. The simple fact is “less may be more”.